You know I’m not much of a chocolate fan but I was intrigued by these Taste of Nature granola bars because they’re organic and non-GMO. They also happened to be on sale so it was a good excuse to test them out. Questions in my head as I picked up the box – would they be too sweet, would they taste good, would they be worth the money I spent (even on sale)? Well, let’s just see, shall we? 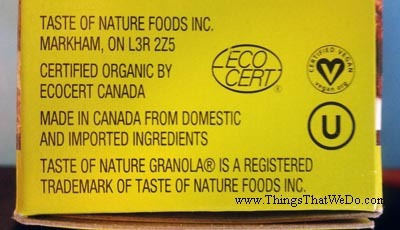 What ingredients are in the Taste of Nature chocolate pecan brownie granola bars? Let’s take a look at the ingredients that went into making these Taste of Nature chocolate pecan brownie granola bars: organic oats, organic cane sugar, organic brown rice syrup, organic pecans, organic palm fruit oil, organic cocoa powder, organic light molasses, agar, sea salt, natural flavours. Well, I love that the organic oats came first in the ingredient list but would rather the sugars not show up as second and third. 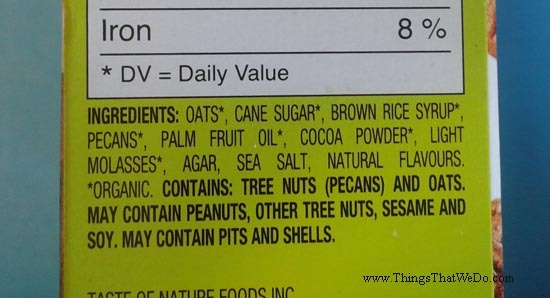 In my wee brain, it would be lovely to have the organic pecans show up as the second ingredient and considering these are labeled as chocolate pecan brownie, I would have loved to see the cocoa powder a little higher on the list too. On the other hand, if I did like these Taste of Nature chocolate pecan brownie granola bars and if I did choose to add them to the snack roster, they would still be just a ‘sometime’ snack item so I understand there’s a ‘give and take’ to this whole process. 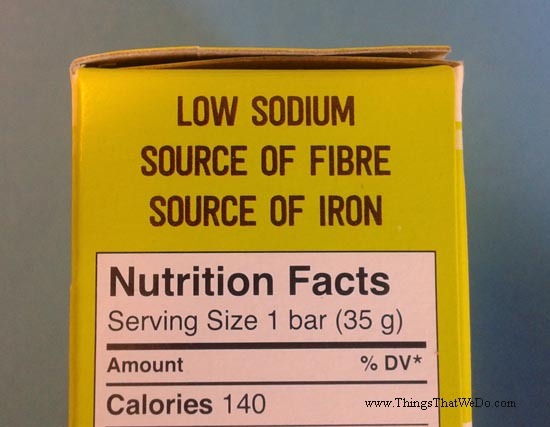 I do, however, like that the ingredient list is pretty short so that’s a good thing. I’m just hoping these Taste of Nature chocolate pecan brownie granola bars aren’t as sweet as some of those other brands. 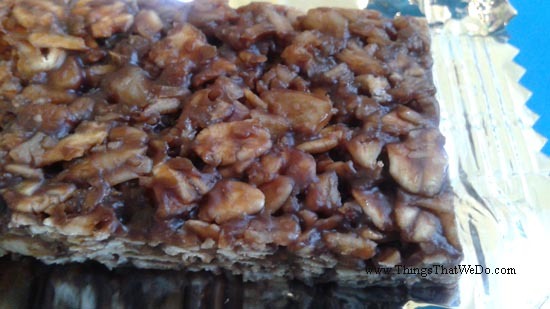 Here’s your Taste of Nature chocolate pecan brownie granola bar. The individual granola bar isn’t very big and that might throw some people off who are looking for a big hefty bar to munch on. It’s great to see those individual oat flakes and not have them look like they’re drowning in brown goo. As for taste…well, I guess they’re okay? I mean, it tastes sweet and chewy like your average granola bar. The oats lend a decent wholesome chew but I can’t say I notice the pecans or the brownie connection. Should I be expecting a brownie taste or a brownie texture? I have no clue but I don’t really notice the brownie reference at all. Don’t get me wrong – I taste the chocolate but brownie? No clue. I notice the nutty taste but can I tell that it’s pecan? Not really. Ultimately, I guess I’m not much of a granola bar fan. I try them on the odd occasion but always seem to find them too sweet for my liking. 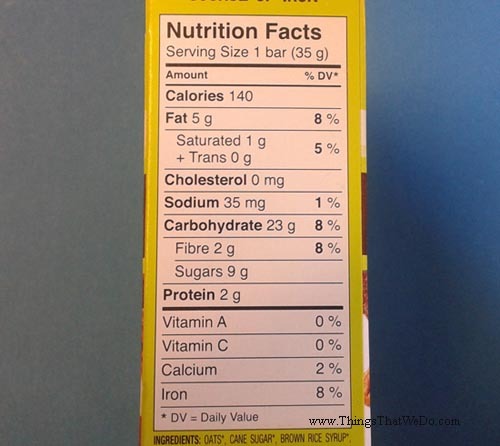 Each 35 gram of these Taste of Nature chocolate pecan brownie granola bars gives you 9 grams of sugar; that seems about average when I take a look at some other brands. 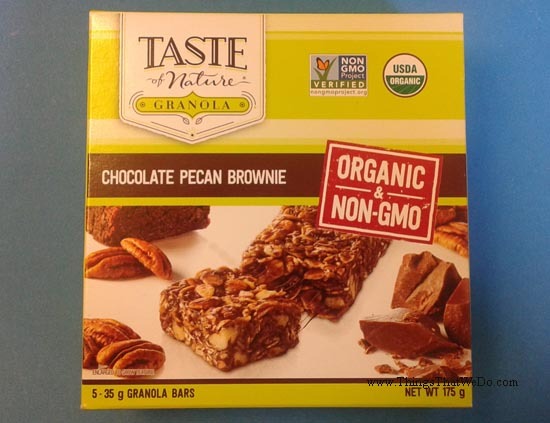 The Taste of Nature chocolate pecan brownie granola bars taste as you’d expect a granola bar to taste except with the added bonus that they’re organic and non-GMO. So, if you like granola bars, you’ll probably like these too and if I did, I’d definitely go for the one with perks. If I had to be honest, I think I was hoping for a little bit more which might not have been a reasonable expectation on my part. After all, it’s a granola bar and I think I was hoping for something a little more savory/neutral and lighter on the sweet scale. Oh well, I’ll just have to keep searching. p.s. 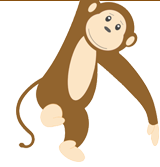 in case you want to learn more about this product, visit their website by clicking here.